After five months I’ve finally watched all nine seasons of The Office. It’s been a long journey but I feel like I’ve connected with this show in a special way. Pam, Jim, Dwight, Andy, Erin, Stanley, Phyllis, Angela, Darryl, Meredith, Creed, Kelly, Ryan, Michael Scott, Toby and all the other characters that helped fill the office every week to make it feel so real and so true to what it was trying to be; a show about ordinary people. The beginning of the season I felt as if it was going against the grain, purposely causing friction between the loveable couple, Jim and Pam. But from the start they hinted at its closure because slowly but surely the documentary was coming to an end after nine years and they were finally releasing promos to announce its debut. Ed Helms’ character Andy Bernard was missing for the most part due to the fact he left on his families boat for one final sail and ended up not coming back for around three months wherein the office was Manager-less. On his return his hair had grown wild taking on a very ‘Castaway’ look. Soon after Erin tells him that they are breaking up because she just doesn’t love him anymore. Pam and Jim had a lot of drama in this final season mainly due to the fact that Jim took a job in Philadelphia without really telling Pam. This caused a rift to grow as Jim spent less and less time in the office with Pam and more time in Philadelphia at the new company ‘Athlead’ which later changed its name to ‘Athleap’. 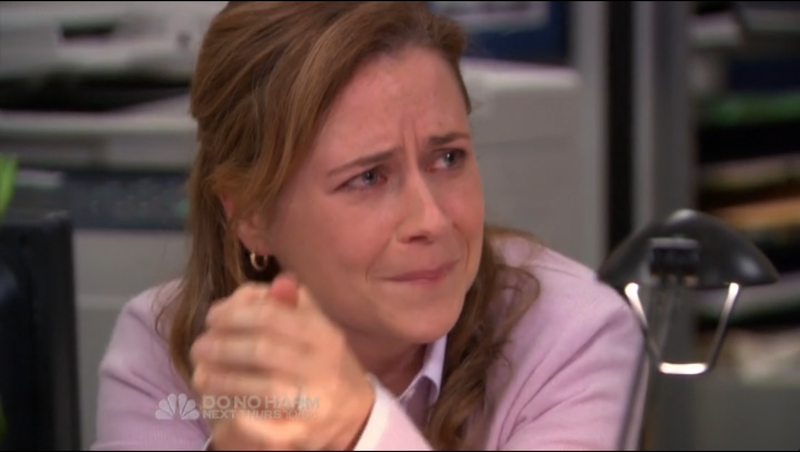 The hardest scene to watch was the phone conversation between Jim and Pam and the argument that ensued about Cece’s dance recital; Boom Operator, Bryan, comforts her afterward. Jim and Pam eventually commit to Marriage/Couples Counselling but that just makes them talk so courteously to each other, thanking the other for doing something that was out of their way. It culminated with an umbrella, Pam runs out to give it to Jim and she walks away but Jim goes after her and hugs her and that was the moment that I felt I could relax because they were going to be okay. Jim moves back to Scranton to be with his wife. Dwight is made Manager, a job he has wanted all his life and it’s a job he was born to do because he just loves Dunder Mifflin and he loves paper. The episode that aired just before the finale started to tie up the loose ends. Andy follows his dream to become famous but ends up tanking an a cappella audition. Darryl leaving was supposed to be silent but instead he ends up dancing with everyone in the office. Jim asks the documentary crew to put together a highlight reel of all of His and Pam’s best moments, their greatest hits all the way back from season 1. Then at the end Dwight speeds up beside Angela and demands that she pull over. When they get out he shouts down his megaphone that he loves her and then he preposes. Angela then admits that Phillip was his child all along. The final extra long episode picks up one year on. Everyone is coming back to Scranton for a panel about the documentary detailing their lives and Angela and Dwight’s wedding. At the panel a woman shows up and tells Erin that she is her mother then a few seconds later her father appears in the same manner. At the wedding Jim tells Dwight that the ‘Bestest Mensch’ must be older than the Groom so therefore he cannot take that position. Jim then looks off screen and stood there is the one and only Michael Scott. I just thought I’d end this with some of the best quotes from the finale.